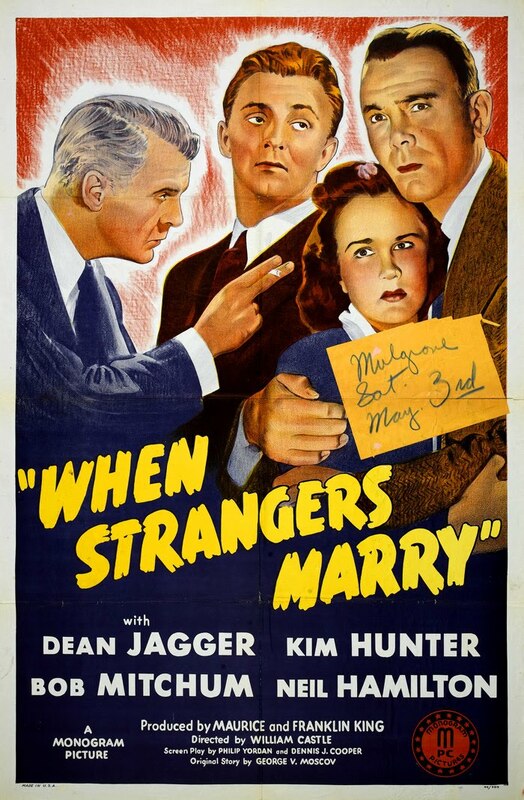 WHEN STRANGERS MARRY is a stylish little 67-minute Monogram "B" mystery directed by William Castle. 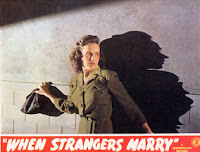 WHEN STRANGERS MARRY was rereleased under the title BETRAYED, and the film has been released on DVD by the Warner Archive under its later title. 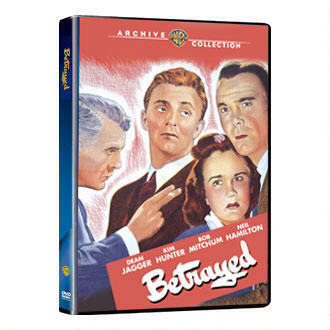 The use of the reissue title is a bit confusing given that there was a 1954 film titled BETRAYED with Clark Gable, Lana Turner, and Victor Mature, which is also available from the Archive. I've chosen to review tonight's 1944 film under its original release title. Millie Baxter (Kim Hunter) takes a train to New York to meet her new husband Paul (Dean Jagger), a traveling salesman she'd only met on three occasions before they married. 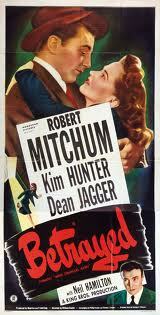 Once in New York, Millie also runs into her old flame Fred (Robert Mitchum), another salesman. Paul doesn't reunite with his bride on schedule, and once he shows up, his odd behavior is unsettling. Millie and Fred begin to piece together circumstantial evidence that might connect Paul with the recent murder of wealthy conventioneer in a Philadelphia hotel. This movie is a wonderful example of how much can be done with very little. The camera and editing choices keep the film interesting and add a great deal to the mood. One of the most notable scenes finds Millie alone in a hotel room, increasingly nervous as neon lights flash outside the window. Another really noteworthy sequence takes place in a Harlem nightclub. The film was effectively shot by Ira Morgan, who had a long career in "B" films. This was one of Robert Mitchum's first big parts, released the same year as his supporting role in JOHNNY DOESN'T LIVE HERE ANYMORE (1944) and his starring "B" Western NEVADA (1944); he also had a role in THIRTY SECONDS OVER TOKYO (1944) that year, and the following year he solidified his move into the big time in William Wellman's STORY OF G.I.JOE (1945). Here he's excellent as the enigmatic Fred, a seeming nice guy who nonetheless seems at times to be holding something back -- and Police Lieutenant Blake (Neil Hamilton) clearly knows it, even if Millie doesn't. I confess I'm not a big fan of Kim Hunter -- I've never cared for her performance in her best-known role, Stella in A STREETCAR NAMED DESIRE (1952) -- but she's really cute in this as the naive young bride. 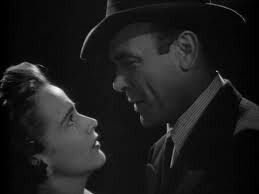 My biggest quibble with the film is that Paul and his behavior remain too much of a puzzle throughout the film, and Millie's decision to remain with him no matter what also seems a bit abrupt. That said, Jagger does the best he can with his underwritten character, straddling the line between deeply troubled and doting on his adoring young wife. The film has solid behind-the-scenes credentials. In addition to horror master Castle as the director, the musical score was by Dimitri Tiomkin. The movie was produced by the King Brothers, who also brought the world GUN CRAZY (1950). Philip Yordan, one of the screenplay's co-authors, wrote a number of excellent movies, including the previously mentioned JOHNNY DOESN'T LIVE HERE ANYMORE, as well as DILLINGER (1945), REIGN OF TERROR aka THE BLACK BOOK(1949), HOUSE OF STRANGERS (1949), JOHNNY GUITAR (1954), THE BIG COMBO (1955), and a Stewart Granger Western I'm fond of, GUN GLORY (1957). GUN GLORY costarred Rhonda Fleming, which makes a nice lead-in to my mentioning that Fleming appears as a young bride in the final scene on the train in WHEN STRANGERS MARRY. Fleming was 20 when she filmed this role. 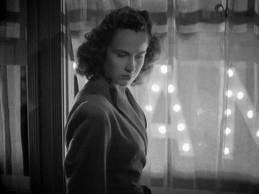 It was her third film, and she then graduated to notable roles in SPELLBOUND (1945) and THE SPIRAL STAIRCASE (1945). In a three-star review in his Classic Movie Guide, Leonard Maltin says WHEN STRANGERS MARRY is "Cleverly directed" and calls it "As good a B picture as you'll ever find." Stephen Scheuer rates the film 3-1/2 stars and says it's "One of the best 'surprise' films ever made." My own rating is probably closer to three stars, an intriguing and visually interesting film from start to finish, despite the questions I had regarding the plot. This was one of the Warner Archive DVDs I won in a drawing at the Noir City Festival, and I was very happy with my choice. For more on this film, please visit Where Danger Lives, where Mark describes the film as "an exciting viewing experience and an offbeat expression of early film noir." This is an excellent little B film, with some great cinematography. There's also an in-joke in the scene when a photograph appears in an abandoned room - and it's of the film's director, William Castle (it's typical of his later style when he made horror films). Odd that WBA would release it under its lesser-known title (could make it a little confusing when trying to find it on the website). Thanks much for your feedback and the insight on that joke about the photo -- that's delightful. I assume there must be a reason for the use of the lesser-known title but I sure don't know what it is! Very puzzling.